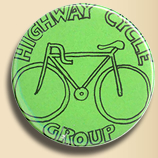 I bid you to welcome to the blog of The Highway Cycling Group, (or Highway Cycle Group, or Highway Cycle Club, inconsistency is one of our many defining features). The Group was started in the 1980s by my father, the late D. G. Evans. He loved making up clubs and groups and this group was basically a formalisation of our family penchant for cycling around Wiltshire country roads. The name comes from the very small hamlet of Highway in North Wiltshire where my father lived for a time. You only found Highway if you were looking for it, you wouldn’t just drive through it as it existed as the only thing on a loop road off the Hilmarton-Bushton road or the Hilmarton-Compton Basset road. Possibly the only local place more isolated was Clevancy which only had one way in or out (by car anyway), but Clevancy had more houses than Highway. With so isolated a location, back in those days there were few cars driving around those lanes, making the roads ideal for family cycling, so father formed The Highway Cycling Group. There were four of us in the ‘core’ of the group with matching tops (blue and white stripes) but many other family friends joined us on our excursions to local pubs, landmarks or people’s houses. All that cycling helped keep me fit and gave me plenty of stamina, standing me in good stead for my first job as a bale-hauler on local farms. I am certain that these early rides, often of thirty-forty miles, completed in my early teens, gave me a strong base of fitness. The Highway Cycle Group was all about A-B or A-A on the bike, no time limits, no races, no flash or ‘fancy’ gear, just the shear pleasure of riding a bike. Anyway, my father has been gone for over a decade and the cycling world is obsessed with racing or mountain-biking, with more and more equipment and expensive materials becoming available for cyclists. Paradoxically, the roads are busier and faster making the leisure cyclist a bit of a dying breed. It is my belief and my hope that there is a whole group of riders who just love to ride a bike from A-B or A-A via B and don’t give a damn about clipless pedals, carbon frames, shaving their legs, gnarly singletrack, fashionable baggies, areo helmets, 22mm tyres, fixed gears, camelbacks, suspension, £100+ cycling shoes or any number of fantastic cycling innovations that, although great, you don’t actually need in order to enjoy riding. I love all the paraphernalia associated with cycling, I love to drool over catalogues and bike mags looking at all the gear (and gears) available, but I could spend a fortune tricking out my bike and it wouldn’t make me a better rider. The Great Eddy Merckx was asked what three things someone could do to be a better cyclist and he said “Ride your bike, ride your bike, ride your bike”. SO with that in mind I have restarted The Highway Cycling Group with the intention of riding my bike (bikes, I have four). If you like riding your bike, whether it’s a beautiful carbon frame racer, a full suspension mountain-bike, a Brompton or a shopper then I invite you along for the ride. This blog will record my rides and my views on cycling, I aim to ride properly at least three days a week and the other days I will pootle on my bikes, taking every opportunity to ride (without deserting my family or work commitments). If I don’t ride, I’ll post some cycling writing about something or other. Maybe this will be interesting to you, maybe it won’t, if nothing else, it’s going to force me to ride my bike or be shamed into silence on this site. If I haven’t posted for a while, it means I haven’t ridden for a while, please feel free to kick my chamois insert to get me going again. 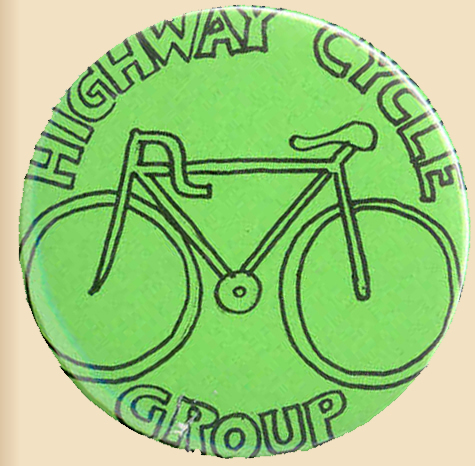 Wish I lived in your part of the world – I can’t believe you’ve a cycling club named after Highway! I’m a died in the wool cycling nutcase, big nostalgist for the old days, saddlebags and jumpers… big racing fan, huge Bettini fan…. And where is my favourite part of England? Where my folks come from…. Clevancy. Ah I don’t live that close to Highway any more, About 40 mins away. I love Clevancy, going up that hill that leads to nowhere before it turns into a track, you could get to Avebury or Yatesbury entirely off road. My best friend was a cousin of the Keevils who lived in Clevancy. A chap called Geoff who lives in Clevancy taught me woodturning, I used to cycle up to his workshop from Hilmarton to use his lathe. Saddlebags and jumpers indeed, you’re talking my language, thanks for leaving a comment. I have a few lovely nostalgic old pictures of Clevancy if you’re interested. I would love to see some old photos of Clevancy, particularly of the shop if you have any. I’ve been reading your blog for a number of weeks and must say I quite enjoy your ride descriptions. Although I live in Australia I get to the UK occasionally and have visited your part of the country once or twice, albeit briefly, even visiting Limpley Stoke for no other reason than I was told that it was where the ‘The Titfield Thunderbolt’ was filmed – The bits on location, anyway. (After cycling, railways are a favourite interest) It’s a wonderful part of the country but some of the hills are challenging. I remember driving to the CrossGuns in Avoncliff for dinner and thinking that I wouldn’t like to be cycling! You mentioned in your recent description of an evening ride that you’d enjoy riding through until sunrise. Audax has an annual ‘Midnight Century’ here each December and I can assure you that you would really enjoy the experience, although December might not suit you as well as it suits us here…. Just come across your blog. 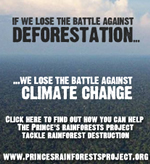 Have you seen my website and it`s cycle club? I wonder if we`ve passed each other on the road without knowing who the other was? Thanks very much for your very kind and encouraging comments. You’re right about the hills, Winsley Hill is a big ‘un, the Limpley Stoke one isn’t too bad, it’s long rather than steep. BUT if we’re talking about Avoncliff to Limpley, the canal path is almost dead flat and will take you right from Devizes through to Bath, then from Bath you can cycle the old railway path all the way to Bristol, the whole route is pretty much flat. I recommend it most highly next time you’re on these shores. I’ve just had a look and I didn’t have any idea about your club until now. It looks like it’s very much in the same spirit as the Highway Cycling Group and I’ll be joining you for a ride as soon as I can get myself organised enough to do it. It’ll make a nice change from going out with the sporty chaps I hang out with. We may well have passed each other – what bike do you ride? I’m overhauling the link section soon and adding a whole pile more blogs and links, I’ll pop your club on there too. Hopefully we’ll meet on the road soon. I ride an Airborne Zeppelin. I may ride tomorrow morning, then my next window is 23rd and 24th July, strictly weather permitting. I have only just resumed riding since a heria op., but I hope to be up to 33miles (my route 2) by 23rd. What days do you normally ride? Talking about cycling paraphernalia, did they have chamois inserts, back in the 1980’s? What did they do to relieve the problems associated with cycling, back then? Hello, just dicovered that you exist, looks fun. 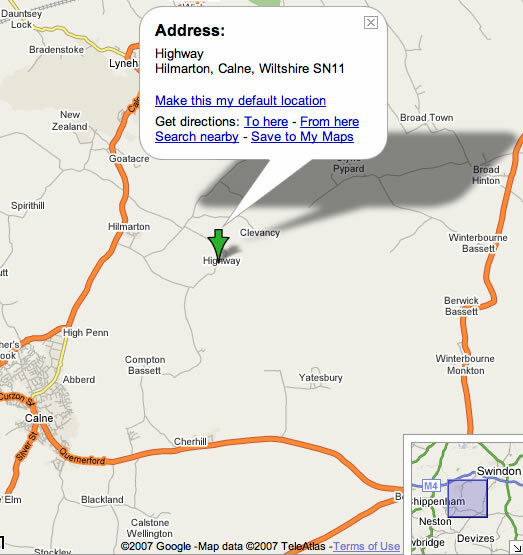 I live in warminster and had no idea you were active around these parts. I am hoping to organise an event during national bike week next June[13-21 2009] here in warminster with a mass ride and an event in the town park. Could you?would you? join us if it all takes place, love the style of your website. I fully a with my good Friend Colin. This is a cracking site I must make time between rides to read more. I will be riding from Bath if the weather is good or from Warminster if it is bad to Bristol tomorrow, along the canal and railway track. Back by tea time I hope. Thanks for your comments – I would love to join you in Warminster for the event – sounds good. Keep me posted! Recently found your blog,always a refreshing read. Enjoy your ride descriptions and writing style. Look forward to future stories. Any chance you could put in an appearance at the Assembly rooms this Friday the 17th Oct so we could put a face to a name and talk over the planned cycle event we flagged up recently. The Community Day runs from 10am to 7pm you will see our table and meet either me Colin, Ian or Gordon. All those reading this and interested in finding out more please come along and say hello. As luck would have it I’ll be on my way through Bath on my way to Bristol to see Tom Stubbs’ film ‘Rime of the Ancient Mariner (on Bicycle)’ So I will gladly drop by to say hello and have a chat about the cycle event. Brilliant – I look forward to seeing you there, it’ll probably be mid to late afternoon when I make it into Bath. …and as a follow up to that last comment – the event is actually in Warminster assembly rooms, not Bath. So see you chaps there late morning. Yes just to reiterate the event is at The assembly Rooms in Warminster on Friday 17th October, tomorrow, between 10 and 7pm, the assembly rooms can be found in Morrisons supermarket car park off warminster high street. Find woolworths and go to the car park at rear. hope to see some of you there for achat and a cuppa. Hi, i’m wondering if there is anyone here who lives in or around warminster who rides the road and would want to hook up with me for some rides. I’m 17, from warminster and i’m training for an end to end ride in the summer. I ride between a 15mph to 18mph average but i don’t mind going slower or (try) faster. I look to do rides between 25 to 50 miles or 15 mile hard efforts. Using my partner’s computer and she happens to have wordpress so logged in. My name is Merlin and I run http://www.re-cycle.org, shipping used bikes to Africa. Shipping bike 30,000 next week. Read your article in Ride, who kindly gave us the profits from issue 1. Just heard you on the Bike Show podcast and couldn’t believe it when you explained how your club got its name. I grew up in Highway (74′-84′), lovely place to live. I learned to ride my first bike there, half the population (6 people) turned out to watch me crash on my first attempt. I spent a lot of time on my re-sprayed yellow Raleigh Chopper cycling up and down the narrow lane. I probably watched you all go by a few times – it would have been very exciting as it seemed almost nobody ever came past our house for days on end. Hi, i have come across your blog by accident, having gone for what was meant to be a gentle sunday morning ride i ended up on the rather challenging Brassknocker hill out near limpley stoke. (my lungs still ache) and whilst hunting for the gradient i came across this blog. 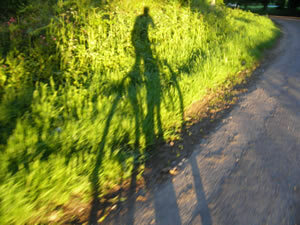 You seem to have my ethos of cycling, not speed, not drama, but a gentle ride thats challenging but not too exhausting. im going to have to set aside a few hours to read all of this site but im sure it will bring me great pleasure. Hi Tim, thanks for your very kind comments, I’ll add soem more material to the blog very soon – Thank you for reading – hope you enjoy the rest of the stuff on here. Not sure how I ended up on your site, but had an enjoyable read. The Normandy trip looked fun but cold!! Many thanks for your kind comment, glad you found the site. It was indeed very cold at times, and very hot at others. Stumbled upon your blog by accident and have thoroughly enjoyed reading it – you seem to have the same ‘ethos’ as me about cycling, don’t be too precious about it, just get in the saddle and pedal! I’m a 55 year old with a sedentary job who has recently (in the past six months) taken up cycling again to improve fitness, starting with cycling to work every day, a ten mile round trip, and more recently taking on some longer weekend treks. I dug out my old heavy, steel-framed Raleigh Amazon hybrid to get cycling again; I took it into my local bike shop to get the gears overhauled and the guy said “that’s a blast from the past!”. Cheeky bugger, but very helpful, did thorough job on gears including replacing ratchet in gear shifter for £20 all in. This weekend just passed, I did 38 miles to Brecon from my home in Hereford in the monsoon rain which affected the Ryder Cup, and stayed in a b&b overnight (not as hardy as you with your camping – they call that credit card touring, don’t they?). The next morning, I did another 38 miles over the Beacons and down the Swansea Valley, a fantastic run. After watching my football team Swansea take on Derby County, I cycled to the station and got the Heart of Wales train (always very cyclist friendly) back to Bucknell in Shropshire, where my wife was waiting to pick me up in the car (an estate with room for the bike in the back). I’m not confident enough to take on night time riding yet! I’m now thinking of getting a new bike and agonising about spec and how much to spend. I’m looking at the Dawes and Land Rover ranges of trekking bikes respectively, preferably an aluminium frame to help me up hills, but also wondering if I ought to be contemplating spending twice as much on something more exotic. Any words of wisdom welcomed. And keep writing! Isn’t anyone using this page any more? I’m fed up of reading the last post from me, dated October 2010, so I’m going to reply to myself. Well, I did go for something more exotic in the end, but at not much more money. Yes, I got on E-bay and picked up a nine month old Specialized Sirrus Sport for £235. It’s an all-aluminium frame and best described as a road bike with flat handlebars. I’ve since fitted it out with mudguards and a Topeak pannier rack and bag system, as well as some good, amazingly cheap lights from China (again via E-bay) to complement the Cateye speedo that it came with, courtesy of the previous owner. I have to admit that, at first, I didn’t like the bike compared to my old Raleigh battleaxe. It was like driving a Ferrari after knocking around in an army Landrover. Very temperamental, gears and chain which seemed to seize at the slightest opportunity, thin wheels leaving it prone to feeling every bump in the road and dangerous swerves when rubbing up against square manhole cover sides. Razor sharp racing saddle not doing much for my undercarriage, either. To add insult to injury, my working commute dropped down from 30 minutes to 35 minutes despite my best efforts! Couldn’t understand that at all. Now, at last, I’m warming to the bike. Yes, I still have to pick my way round the potholes very carefully, but I’m now finding the gearing more responsive and more flexible than the old machine. I’ve got the commute time back up to 32 minutes – I think the difference is the extra weight of the pannier rack and bag – and look forward to trimming more minutes off as I get fitter. I certainly don’t miss the sweaty back after toting the rucksack to work carrying my lunch and change of clothes. i came to this blog through the bike show, and your interview with Jack on the Ridgeway. it was fantastic, and i hope you don’t mind but i’ve quoted you a bit on a post today. Thank you for your kind comment – sorry for the delay in approval – no reflection on you I assure you – I’ve switched computers and the notification email fell between the cracks. I love your blog and I’m linking to it in a post I’m writing now. Thanks for transcribing my words from The Bike Show – the alternative sub title for this blog was “waxing lyrical about a ride to the shops” so I think I am a very suitable candidate for Pseuds corner. I read your blog with great interest.I live in Melksham(Twinned with Chernobyl, I think)and my late father was stationed at Yatesbury at the time of D Day.He was seconded to the hospital at Wroughton and spent five days collecting and incinerating amputated limbs from the multi theatres at the hospital.I believe that all the D Day CasEvacs requiring amputaton went to Wroughton.He was just 19.Anyway, enough local history,I was a runner 15 years ago and pretty fit.After having a good deal of cartilage removed from one knee I ,stupidly,gave up excercise.I am now one cyclist tall and two cyclists wide but, enough is enough – I have a Brompton on order, under the Bike 2 Work scheme and I may be in touch when I am fitter!Cycling 10 miles either end of a 12 hour shift isn’t within my zone, hence the ‘folder’ – drive halfway and ride, that’s the plan.Brompton M6L racing green and black, before anyone asks. Hi . does any one have highway cycling route off usa ? it would be great help if any one can provide me route or give me guidance about driving cycle on highway…. you can email me on patel_ronaks@yahoo.com….